Follow DAMPIT humidity indicator directions carefully. (2) Pinch end of DAMPIT to remove excess water. Gently wipe outer tube dry. Place inside instrument. When DAMPIT is nearly dry repeat the above process. (3) The DAMPIT humidity indicator will show the percentage of humidity of your room. The numbered spots on the left will change color as the humidity changes. If the segments are all pink the humidity is over 50%. Determine the percentage of humidity by choosing the numbered spot most closely matching the color of the background panel on the right. Take the reading for your instrument at the point where there is a division between light pick and light blue. 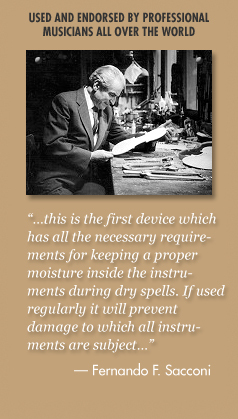 (4) The DAMPIT may remain inside the instrument while it is played. There will be no tonal loss. (5) Store your instrument in the coolest part of the room away from radiators and heat registers. (6) Use DAMPIT only during dry weather or central heating periods. 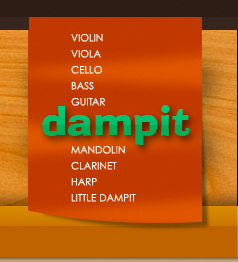 Dampit is the original instrument humidifier for string instruments and has been protecting wood instruments against cracking, pitch drift and dry weather conditions for over 40 years.